Outstanding at the 2017 World Junior Championships in Riva del Garda, when in the third match of the Girls’ Team final against China, she beat Shi Xunyao; the host nation’s Miyu Nagasaki duly booked her place in the Women’s Singles event at the Seamaster 2018 ITTF World Tour Lion Japan Open in Kitakyushu. She emerged successful in the final preliminary round beating Slovakia’s Barbora Balazova (11-7, 11-7, 6-11, 11-8, 9-11, 11-7); likewise China’s Gu Yuting accounted for Chinese Taipei’s Lee En-Chi (11-7, 11-6, 11-6, 11-2). 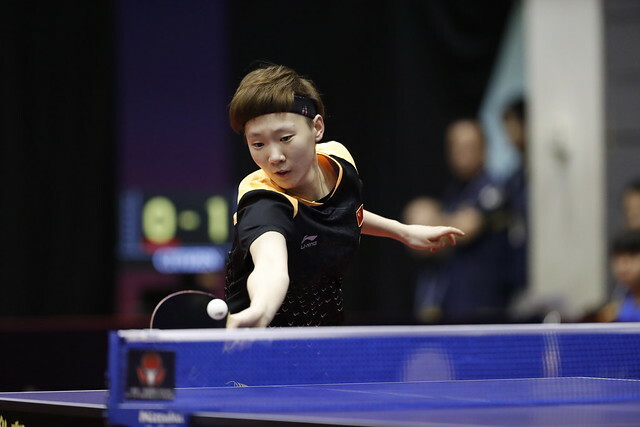 Both were wins as anticipated but in the remaining six contests that brought play to a conclusion in the Women’s Singles tournament there were upsets; the biggest casualties being Korea’s Jeon Jihee and Yang Haeun alongside Hong Kong’s Minnie Soo Wai Yam. Defeats by narrow margins were the order of the day. Listed at no.25 on the current Women’s World Rankings, Jeon Jihee was beaten by the host nation’s Minami Ando, named at no.64 (11-3, 2-11, 11-9, 4-11, 10-12, 17-15, 11-4); Yang Haeun, ranked no.32, departed at the hands of colleague, Kim Hayeong, who stands at no.419 (12-10, 11-4, 11-9, 12-14, 9-11, 10-12, 11-2). Agonising defeats, it was the same for Minnie Soo Wai Yam who currently appears at no.33 in the global order; she lost to Norway’s Ma Wenting who occupies the no.284 position (9-11, 7-11, 11-3, 14-12, 11-5, 6-11, 12-10). Similarly in hard found contests, Chinese Taipei’s Cheng Hsien-Tzu, presently at no.71 was beaten by Singapore’s Lin Ye, standing at no.71 (3-11, 11-7, 9-11, 11-4, 11-7, 7-11, 12-10). Success for Singapore but there was the reverse side of the coin; Zeng Jian lost to Korea Republic’s Yoo Eunchong (17-15, 13-11, 16-14, 11-6). Currently Zeng Jian is ranked no.40, Yoo Eunchong is at no.70. Meanwhile, not to be left out of the party and to join colleagues Miyu Nagasaki and Minami Ando in the main event; Miyuu Kihara, 13 years old and listed at no.84 in the world order, beat the Czech Republic’s Hana Matelova who appears at no.51 (11-4, 2-11, 11-4, 8-11, 11-7, 11-9). Problems for Zeng Jian in the Women’s Singles qualification tournament; partnering Zhou Yihan there was a somewhat surprise preliminary round Women’s Doubles exit. The duo experienced defeat when facing the hitherto untried combination of England’s Tin-Tin Ho and Norway’s Ma Wenting (13-11, 9-11, 11-9, 4-11, 11-5). One surprise and there was one more in the quest for Women’s Doubles main draw places; the combination of Spain’s Galia Dvorak and Britt Eerland of the Netherlands lost to the Thai pairing of Nanapat Kola and Thapanee Phomma (11-5, 10-12, 14-12, 8-11, 11-9). An unexpected win for Thailand but there was defeat; sisters Jinippa Sawettabut and Suthasini Sawettabut experienced defeat at the hands of Gu Yuting and colleague Mu Zi (11-6, 11-5, 11-3). Similarly, in the one match required in the Mixed Doubles preliminary round it was defeat for Thailand. Yanapong Panagitgun and Jinnipa Sawettabut lost to Slovakia’s Lubomir Pistej and Barbora Balazova (11-6, 7-11, 11-4 11-1). No matches were required in the Men’s Doubles preliminary round; the eight pairs entered all received direct entries to the main event.